Born in Chicago, Illinois on February 8, 1862, Sara Shewell Hayden graduated with honors in 1890 from The Art Institute of Chicago before moving to Cincinnati, Ohio to teach at Mount Auburn Young Ladies Institute. She returned to Illinois the following year to accept a position at Grant Collegiate Institute where she taught for four years. This prestigious prep school, formerly called Misses Grant’s Seminary for Young Ladies, trained women for Vassar College in New York. During this time, she had three watercolors accepted in Chicago’s 1893 Woman’s Illinois Exposition at the World’s Columbian Exposition. Hayden left her teaching positions to travel abroad in 1896 and spent two winters in Paris. She worked in several painters’ studios including that of American Charles C. Lasar (1856-1936) who opened his atelier to English-speaking women including famed painter Cecilia Beaux (1855-1942). Although few women were included in the Paris Salon in the late 19th century, Hayden’s art was the exception in 1898. Her work was also exhibited widely in the United States at venues in New York, Philadelphia, Chicago, and St. Louis. In 1899 the position of Art Department director at the University of Nebraska in Lincoln became open with the departure of Cora Parker. William M. R. French, Director of The Art Institute of Chicago, recommended that Hayden, one of his students and a talented silver medal recipient, inquire about the position. Hayden applied and was offered the post the same year. During her years in Lincoln, Hayden taught drawing and painting and also conducted art classes for the public on Saturdays. A few years later, the artist was commissioned by the class of 1902 to paint a portrait of Ellen Smith, the University’s first female faculty member and registrar, who had died after many years of service. Although portrait commissions would have been more lucrative, Hayden also painted other subjects. 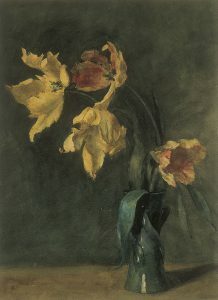 In the Museum of Nebraska Art’s still life titled Tulips, Hayden used watercolor, however the dark, rich hues and velvety background resemble oil painting. Hayden placed the vase off center allowing the expressive flowers to bend toward the middle of the painting. Not unlike her mentors Frank Duveneck (1848-1919) and William Merritt Chase (1849-1916), Hayden’s painting possesses dark romantic qualities with visible brush strokes and reflective light and shadows that reveal their source. Hayden captured the elegance of the flowers and established a dark, brooding mood in her work through color, light, and composition. In 1905 Hayden notified the University that she was taking a one-year leave of absence to accept an invitation from Chase to paint and study in Spain and revisit Paris and London on her own. The trip would include landscape painting, studying from living models and masterpieces at Spain’s Prado Museum. Her letter to the Chancellor and Board or Regents emphasized Chase’s reputation as an artist and the prestige this would bring to the University. She continued: “I feel sure that the benefits resulting to the University from renewed personal vigor and the accumulation of desirable material for lecture purposes will offset any feasible disadvantage.” For her replacement, she strategically wrote that Director French of The Art Institute could recommend a substitute. Records such as this as well as painting commissions and sales indicate that Hayden enjoyed autonomy during her 17-year stay in Nebraska. Hayden arrived when the art community in Nebraska was beginning to flourish. The Haydon Art Club, established in 1888 and one of the first arts organizations in Lincoln, had become the Nebraska Art Association (NAA) the year after Hayden’s arrival, and its activities helped to bolster the art climate. The tradition of hosting exhibitions of East Coast art that Hayden’s predecessor Cora Parker began was becoming well established. The NAA, according to Hayden, had hosted several exhibitions and had guaranteed the safe arrival and return of the artwork. From these exhibitions, the NAA purchased pieces for its collection and, as artists learned of these practices, they were more willing to send their works to Nebraska. Hayden was 54 when she resigned from the University in 1916 and returned to Chicago. A search for an exhibition record brings up little evidence of art activity after she left Nebraska. In a letter to Clarissa Bucklin for Nebraska Art and Artists in 1930, she spoke of being a “shut-in” for the previous 10 years and that she was not well enough to “stand much excitement.” She died in 1939 in Park Ridge, Illinois. The Museum of Nebraska Art has one work by Sara Shewell Hayden. Researched and written by Sharon L. Kennedy, 2000, now Director of Education, Sheldon Museum of Art. Revised, 2013, a project of MONA’s Bison Society. W. B. Conkey Company, Official Catalogue of the Illinois World’s Exposition Board, 1893 https://archive.org/stream/officialcatalogu00illi#page/n11/mode/2up, 54. Information in a letter to Chancellor and Board of Regents from Sara Hayden, University of Nebraska-Lincoln, April 8, 1905. Information in a letter to Clarissa Bucklin from Sara Hayden, Chicago, Illinois, November, 1930.